I've been tagged by Wendy, gorgeous Wendy, from A Wee Bit of Cooking for the Seven Random Things Meme. As I’ve already revealed some things last time around (including a love of dogs we share), I’m going to keep this one slightly more focused on food. And books. 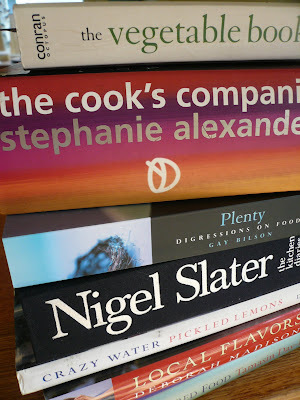 After years of selling and hoarding them, here are seven not quite so randomly selected cookbooks that have made a huge impact on me. How I love this unpretentious little book. 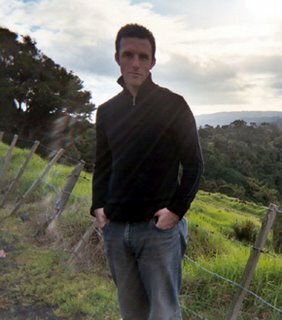 Spencer makes use of ancient and medieval sources, as well as looking to more 'recent' literature from the likes of Hannah Glasse and Mrs Beeton to provide nutritional insights, gardening tips and ultimately manages to write a book that is at the same time both compelling and utterly, utterly delicious. A multi award-winning memoir about a life lived with food. It’s a complicated and enviably well-crafted book, written with great, great skill. A restrained, playful use of language is coupled with thoughtful and provocative views of not just food itself, but the rituals we humans weave around these things. Beautiful seems like a much-abused word, but in this case, used in its simplest and most subtle form, it is an apt description. Pretty much what everyone who blogs is attempting to do, this diary of a year in Nigel’s kitchen is breathtakingly seductive. Evocative, seasonal light floods the photographs in these pages allowing produce, rather than the cook, to be the star. No-one writes about home-cooked food so damn well. Lots of meat to wade through yes, but there are real gems to be found in these pages. Much has been written about this book and for good reason - it's inspirational from beginning to end. Chapter titles like Sweet Cloves and Liquid Gold, an exploration of garlic, olives and olive oil, evoke more than just a sense of place. Henry’s introductions in fact hide a wealth of glorious recipe ideas. A book to take from the kitchen to the bedside table and back again. Enough to make a southern hemisphere-based girl green with envy of the bounty of a U.S. farmer’s market. A seasonally-based book, brilliant from beginning to end, this is by far my favourite of Madison’s books. She really, really knows how to cook vegetables. A treatise on Good Cooking. With recipes. Love everything about it, from the photography to the layout, the typesetting and most importantly, the words. Tamasin is a little bit bossy, but don't let that put you off. Hers is a well-developed palate and with impressive literary connections (brother is actor Daniel, father Cecil was poet laureate and a one-time boyfriend was Martin Amis) it is little wonder that she writes so compellingly. I couldn't agree with you more about Nigel Slater being such an inspiration to food bloggers. Sadly, so few get there. Instead, drifting off into such personal or trivial waffle. I applaud you for your list. Happily, I own most of them also. I am sure you would know the book 'Honey from a weed' by Patience Gray. Truly lovely. Hi anon, you are so very right about Nigel. Essentials of Classic Italian Cooking by Marcella Hazan - for the right way to cook just about any Italian dish. Verdura by Viane La Place - full of inspirational ideas on cooking with vegetables. French Provincial Cooking by Elizabeth David - Will any book on French cooking ever equal this one? Real Fast Food by Nigel Slater - There is no excuse ever to eat boring food when you have this book on your shelf. Still Life with Menu by Mollie Katzen - I've cooked most of the recipes in this vegetarian cookbook, with is illustrated with Katzen's own watercolours. Rosa, I'm going to have to expand my already groaning shelves too! I have Verdura (marvelous) and French Provincial Cooking (you are so right - no-one, in English at least, has matched it). But now I want Marcella and the Mollie Katzen one. Lucky I've got a couple of weeks left at the book shop - I can get a few orders in while my discount still applies! I have three out of the seven and am determined to find the others now. I love hearing about others books and might even do an entry about some of my favourite books sometime. I don't know if I own any of those but I am constantly thinking I should own Stephanie's, though generally I stick to vegetarian cookbooks so I have more recipes I can cook. I am a big fan of mollie katzen so would recommend her books to you! You know Johanna, Stephanie is surprisingly useful. I tend to stick with the vego ones too and yet whilst I've got the first Moosewood one lying around here somewhere, I still haven't ever used it! Will dig it out on your recommendation. Wonderful list - several are new to me, and I'm off to the library now to request them! Wonderful - I love hearing about shared favourites. I really didn't need to know about the other four though Lucy - my shelves are groaning enough as it is! Now this is a seriously cool way to learn about a fellow blogger. Their 7 favorite food books! It should be a meme unto itself. I am so with you on the Nigel Slater!!! And very intrigued by a few of the others too! Thanks for the recommendations! Hi Lydia, you may have a little trouble finding the Gay Bilson one. As she is now a complete recluse, and an Australian one at that, you may need to do a special request. Worth the effort though. Hi Sophie - mine too. So, which ones do you have? Three times Susan?!? Funny how these things go around. By all means, consider your good self tagged. I love peeking at other people's shelves. I've had Stephanie Alexander's book on my wish list for more than a year now, I really need to get it. I have Nigel's book wish-listed too. Will now add Diana Henry. Lucy - Thank you so much for visiting my little blog and for leading me to yours. I bought Deborah Madison's "Local Flavors" when I decided to really make use of the nearby (at the time) farmers' market. She is so experienced with vegetables and knows how to bring out the best of them. I am keenly interested in Gay Bilson's and Colin Spencer's books. I have already put Diana Henry's on the shopping list (her "Roast Figs, Sugar Snow" is one of my all-time faves). I may take up this meme challenge (it is, really, for we foodies tend to have very overburdened shelves) soon. Hi Cynthia - go straight to Amazon and order it now. No time like the present. Shaun, you are very welcome. 'Roast Figs' is beautiful and don't you just love those introductions that Henry peppers with amazing food ideas? And as for Madison, I have to say in all truth that even her Tofu book manages to surpass any other that I've seen (not a tofu fan, personally). Think you'd like the Bilson - it's unique. She's a little bit mad, but I like that! Hi Lucy - this is a wonderful post and very inspiring. It's given me plenty of titles to look up and find. I have both Stephanie Alexander's and Elizabeth David's wonderful books and I love reading Nigel Slater's recipes on the Observer website. I recently read a biography of Janet Ross, who wrote Leaves from a Tuscan Kitchen, and I would love to track down a copy, as the excerpts from the book are wonderful. Melinda, you know I love seeing what inspires other people book-wise. How funny that you should mention Leaves From A Tuscan Kitchen - it's a favourite and one I struggled with leaving off the list of seven! It's just been re-released by Grub Street (Capricorn Link distribute here in Australia). Love the book, but haven't heard of the bio - what's it called? It's called "A Castle in Tuscany: the remarkable ilfe of Janet Ross" by Sarah Benjamin. It's a great read and beautifully presented. Off to order it now. I remember the book coming into the shop (and leaving pretty quickly too) at Christmas last year. Beautiful thing - had no idea of the subject matter though! Sophie Tamasin IS a bit scary - she's bossy alright - but reading her is for me, one of the greatest of food-related pleasures. I love her book West of Ireland Summers too.